A journey map can show you the strengths and weaknesses of the whole visitor experience at a glance. 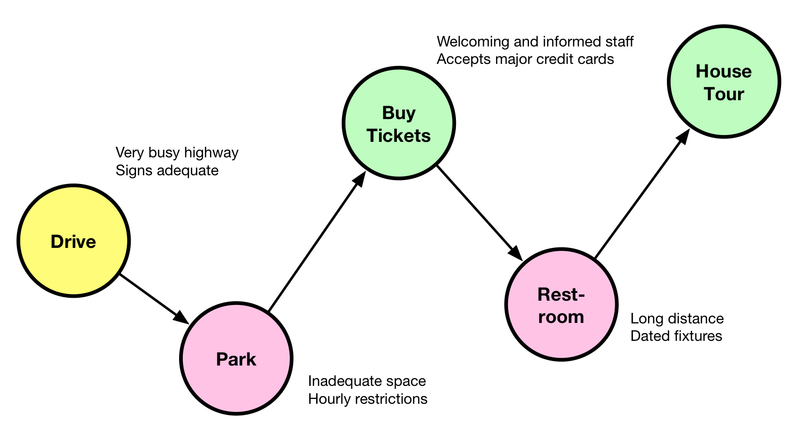 When people visit historic sites, they not only take a tour but they probably explore your Web site, buy tickets for the tour, shop in your store, and use the restroom. While the tour might be outstanding, the entire experience can be spoiled if the visitor couldn’t find a parking spot, got soaked in a thunderstorm, was frustrated by a broken credit card machine, or encountered a dirty restroom. For most people, a visit to an historic site isn’t just about the tour, but the whole experience from beginning to end. If one element goes awry, the entire visit can go bad—even if you had absolutely no control over it (like the weather). To improve visitor satisfaction and increase attendance and impact, historic sites are now examining the entire visitor experience to be sure every part functions well and works seamlessly from beginning to end. One of the best ways to analyze and improve the experience is through a “journey map,” a diagram that lays out every step in the visitor experience from home to historic site to back home. It can help organize planning and evaluation; simplify understanding of complex processes; and easily show how different parts of the organization contribute to an excellent visitor experience. For the past two decades, hotels, airlines, and other customer-oriented businesses use this technique to generate higher satisfaction rates and build stronger relationships for increased profitability. Only recently have non-profit organizations adopted mapping as a method for analysis and planning. I mentioned journey mapping previously but because there continues to be so much interest in the topic, I’ve written, “Creating Visitor Journey Maps for Historic Sites,” a free a four-page illustrated handout that explains the process in more detail. Journey mapping has become a standard process for me in developing interpretive and strategic plans at historic sites, but I can also see it used for evaluating membership programs, fundraising, board development, and even collections management if you replace the visitor perspective with that of the member’s, donor’s, board member’s, or object’s. I plan to incorporate this handout in my forthcoming book on interpretive planning for historic house museums, so if you have comments, suggestions, or questions to improve this information, please share them below or send me an email. This entry was posted in Community engagement, Governance and management, Resources, Strategy and tagged Customer journey map on July 26, 2016 by Max van Balgooy. This is SO true! We had a family that drove from another state to visit us. Their GPS directed them incorrectly, but they trusted it over our signage (*sigh*) and ended up in the next town. By the time they arrived they were loaded for bear and nothing we did could have made them happy. For decades our historic house museum had no designated parking and no clear driveway — people didn’t stop because they didn’t see obvious access. Three years ago I *finally* convinced a largely new board to invest in the construction of a driveway and modest parking lot. Once built, we also added signs directing visitors in and out of the property. What a difference it’s made in our visitor numbers! On a different note, Max, you mention using journey maps for collections management — I think they could also be used for exhibit planning. Thanks for your example how looking at our sites from the visitor’s perspective can reveal serious weaknesses and obvious improvements. And great suggestion for using journey maps for exhibit planning. Thanks!